After finishing looking round Gwolnaegaksa we went on to the east of the palace, where the Nakseonjae area is located. The photo above shows the terraced garden located behind Nakseonjae, with Nakseonjae to the right. 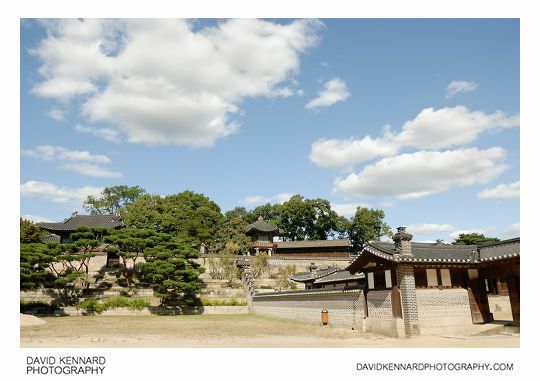 Above the terraced gardens are Seunghwaru (Hangeul: 승화루; Hanja: 承華樓) to the left, which was the crown prince's library, and Sangryangjeong (Hangeul: 상량정; Hanja: 上凉亭) pavilion to the right. 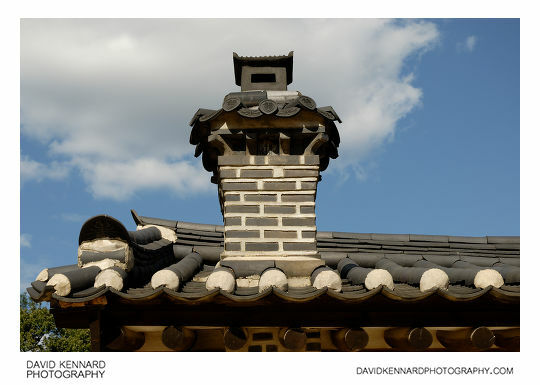 The above photo is of a chimney on one of the side buildings that enclose Nakseonjae. I think the chimney is probably for the ondol under-floor heating system rather than a fireplace. This is the building of Nakseonjae (Hangeul: 낙선재; Hanja: 樂善齋). It was constructed in 1847 by King Heonjong, the 24th Joseon monarch. 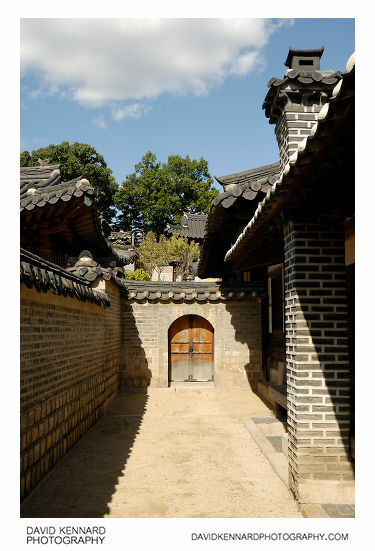 Nakseonjae was used as his living quarters and library. Next door to Nakseonjae, Heonjong had built Seokbokheon (Hangeul: 석복헌; Hanja: 錫福軒), a residence for his 2nd wife Queen Gyeongbin. Between the two areas is this passageway with a small doorway that leads to the terraced gardens behind. 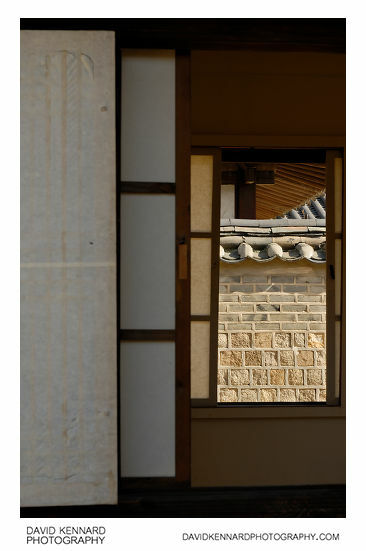 Looking through a window of one of the side buildings that encloses the west side of Seokbokheon towards the wall on the east of Nakseonjae. 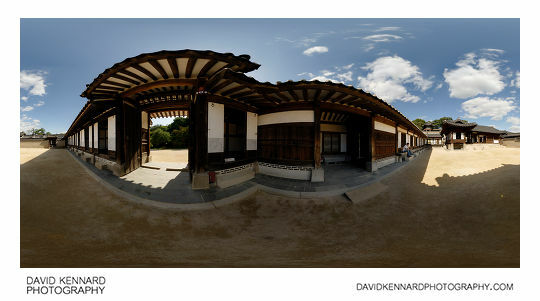 Back in the Nakseonjae compound, I took a panorama by the gate in the south-west corner. Unlike most of the other palace buildings, Nakseonjae lacks the bright and colourful paintwork. Nakseonjae was originally enclosed by lines of buildings and courtyard walls, but they were removed during the Japanese occupation to create the garden. Nakseonjae was restored to its original state in 1996. 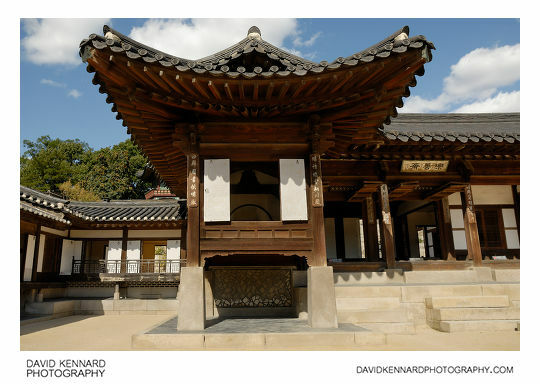 Originally it was part of Changgyeonggung palace, which is located adjacent to Changdeokgung.